Closet Doodles C69 Baby Clothing Dividers Boy or Girl Set of 6 Fits 1.25inch Rod by Closet Doodles at My Pregnancy Place. MPN: 1. Hurry! Limited time offer. Offer valid only while supplies last. 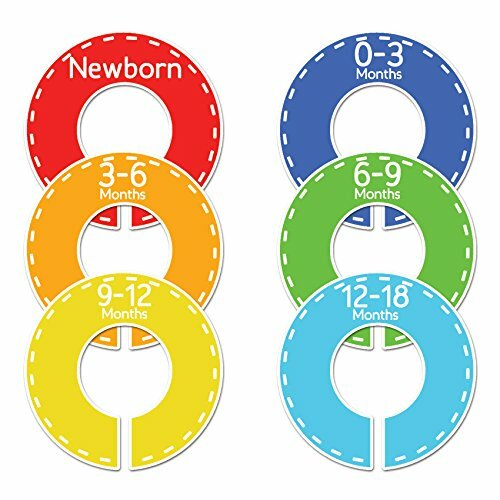 These baby closet dividers will help organize any closet. Comes with 6 dividers that are double sided so they can be seen from either direction. These baby closet dividers will help organize any closet. Comes with 6 dividers that are double sided so they can be seen from either direction. Laser printed on high quality sticker paper. The plastic dividers are 3.5" with a 1 3/8" hole in the center for attaching to your closet rod. The dividers are made of durable plastic and are flexible. NOTE: Make sure your closet rod is small enough for these to go on. If you have any questions about this product by Closet Doodles, contact us by completing and submitting the form below. If you are looking for a specif part number, please include it with your message.